provide quality Autosport driven marketing using Formula racing cars and simulators. This is marketing/advertising and networking using formula racing cars we own or have sponsorship arrangements with for larger marketing exposure. We provide our service primarily in a "dollars for logo placement swap" business plan using formula racing car(s), high performance auto(s) and racing simulators available to us by ownership, sponsorship and other relationships. Call Steven Ford at 844.717.FAST (3278) x102 for more information. The #2 Soul Red Pro Formula Mazda operated out of the Texas AutoSports Facility at Motorsport Ranch and recently raced in the INDYCAR sanctioned 2017 Indianapolis Grand Prix and the 2016 Pro Mazda Championship series is available for arrive and drive sessions with on site driver and car support at Motorsport Ranch Cresson in Cresson, TX. See our products page for more details and call Sitara Wilson with Texas Autosports, 9016 Performance Ct. Cresson TX, 76035 at 817.382.4188 for pricing, specifics and availability. FALL TRAINING SPECIAL - all SIM sessions on the Formula Autosport Enterprises TOPSPEED full cockpit motion simulator with Oculus Rift Virtual Reality are half price from Oct 1, 2018 to Oct 31, 2018... so get on the only full cockpit motion sim with VR in DFW to prepare for your upcoming race or track day at MSR or COTA here in Texas or wherever in the car of your choice . We have the only Top Speed cockpit motion simulator with oculus rift available in the DFW area ... This is the closest simulation to actually being in the race car of your choice on the race track of your choice. Motion and non-motion simulator rentals available with Oculus Rift using iracing, Rfactor, Rfactor 2 etc . Sessions are 150/hr. Call Yoli Ford at 844.717.3278 (FAST) X 101 for specifics and availability. Raced by driver Steven Ford in the INDYCAR sanctioned 2017 Pro Mazda Championship series with a 3rd place National Class finish in both races of the Indianapolis Grand Prix at the Indianapolis Motor Speedway this year. It is on site and on track for testing and track days at Motorsport Ranch Cresson throughout the year with autosport driven marketing opportunities available. Currently being raced by driver Jacob Loomis in all 18 races of the 2017 F4 U.S. Championship series and is available for Autosport driven marketing. Jacob had a 3rd place podium finish with 33 entries in the first race/ weekend of the series and a 2nd place finish in the second race of the race/weekend at the Indianapolis Motor Speedway with 31 entries ... 4 race/weekends remain in the series with the last races/weekend of the 2017 season at COTA/Circuit of the Americas in Austin, TX. September 14-17. Currently being raced by driver Jacob Loomis in all 18 races of the 2017 F4 U.S. Championship series and is available for Autosport driven marketing. Jacob had a 3rd place podium finish with 33 entries in the first race/weekend of the series and a 2nd place finish in the second race of the race/weekend at the Indianapolis Motor Speedway with 31 entries ... 4 races remain in the series with the last races/weekend of the 2017 season at COTA/Circuit of the Americas in Austin, TX. September 14-17. Jacob Loomis in the #82 Optima Anesthesia Sponsored USF17 qualified in the Top 10 for the race at the Road America Grand Prix for the INDYCAR sanctioned USF2000 Championship series presented by Cooper Tires with Team Pelfrey. 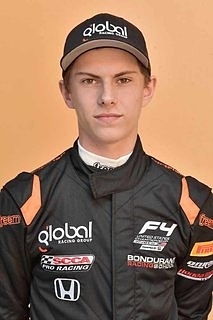 Check out this interview on SoundCloud: Speedcaster Jacob Loomis,Texas F4 Driver #68 Global Racing Group!